Hey guys! I was recently on Spring Break for a week! Let me tell you, it was the best week I had :)! It was good to be able to take a break from all my classes and just have time to relax. So a couple weeks before Spring Break, I knew that I wanted to repaint my room. 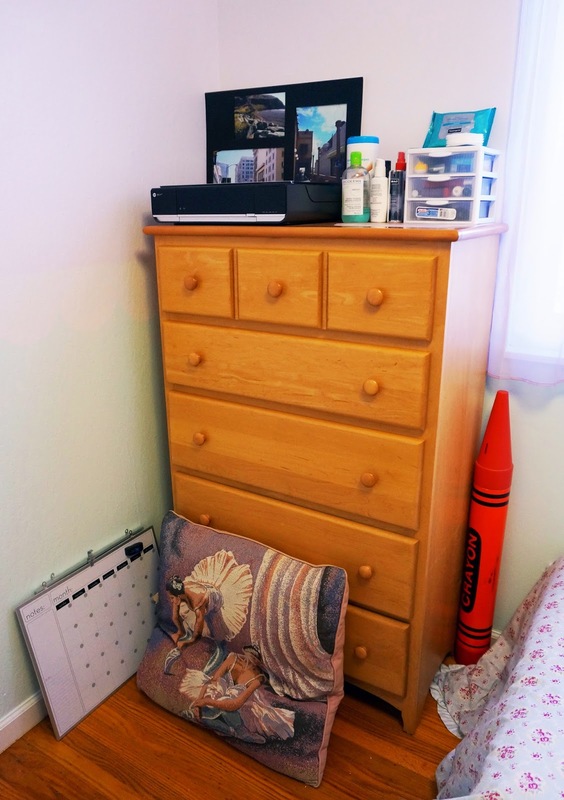 So I admit, I've made my fair share of room decorating mistakes, but I know that choosing the color ORANGE for my room was one of the biggest interior design mistakes I've made besides buying black bed sheets! So let me give you a little back story as to how I chose this darn bright colored orange as a room color. Originally I wanted to paint my room red because at the time, red was my favorite color. However, according my mother and my uncle, it is considered bad luck to paint a room red. This has to do with some Chinese superstition that I don't believe in, but I didn't want to go against their advice. So I decided to pick orange because it was my second favorite color at that time. However, once the paint bucket came in, I didn't realize how blinding bright the orange was. It looked a lot softer / lighter on the paint swatch my uncle brought me. "Well there's no turning back now." For the next four years, I lied to myself. I tried to convince myself that I liked the orange, but deep down inside, I know that I've always disliked it. So I formulated a plan. I was going to repaint that horrendous orange over Spring Break! 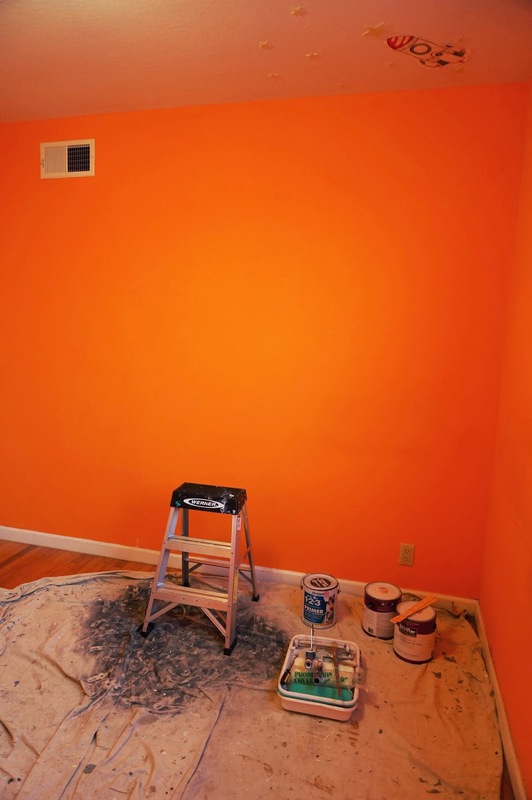 Just to give you an idea of what I had to work with when I started, here's an image of my bright orange wall. It kind of hurts my eyes to look at even now. The walls weren't half bad when I placed the white tree and cloud wall decals on my walls, but to look at just orange, it was definitely an eye sore. As we all know, I'm not exactly the best artist out there. I may doodle here or there, but I'm no pro. So please don't make fun of my drawings ^____^"! I liked this design idea of having a light color on top being separated by a white "lace" border of some sort. This was my first draft! 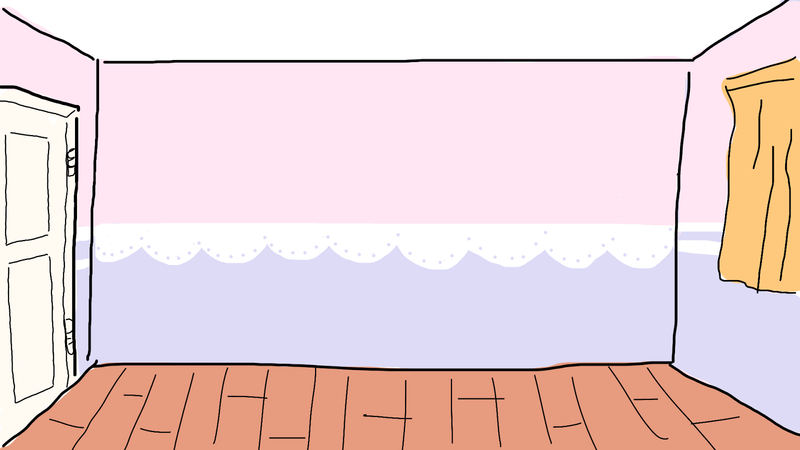 wonky, wrong perspective drawing I made of my room. LOL! 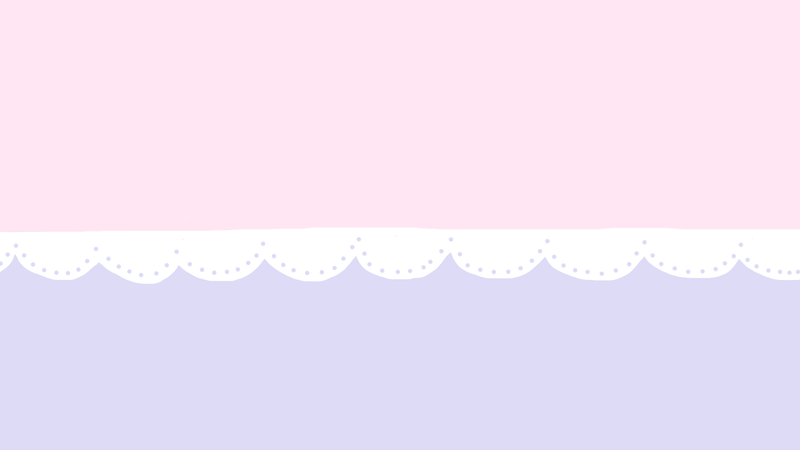 I really like pastel colors. 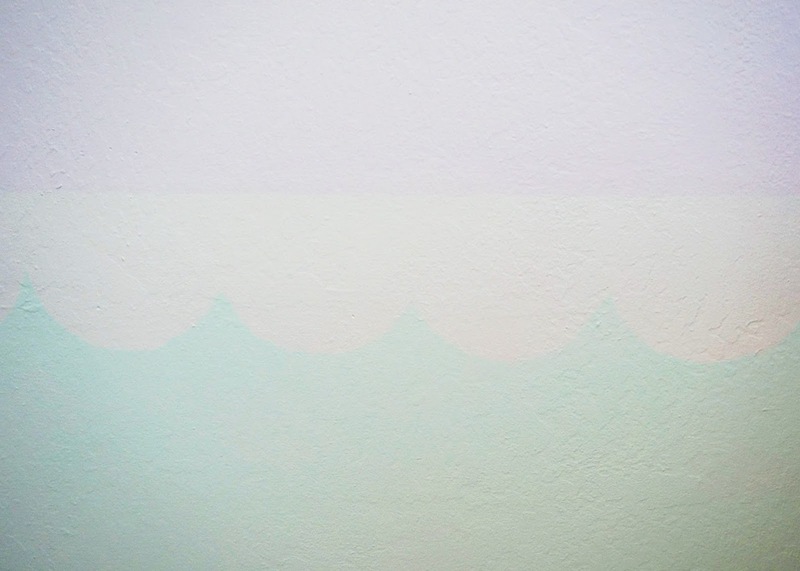 I like the cool tone pastels give off on walls, and I like that those colors feel calming and bright. I thought I wanted a pastel pink and purple room, but I wasn't sure. 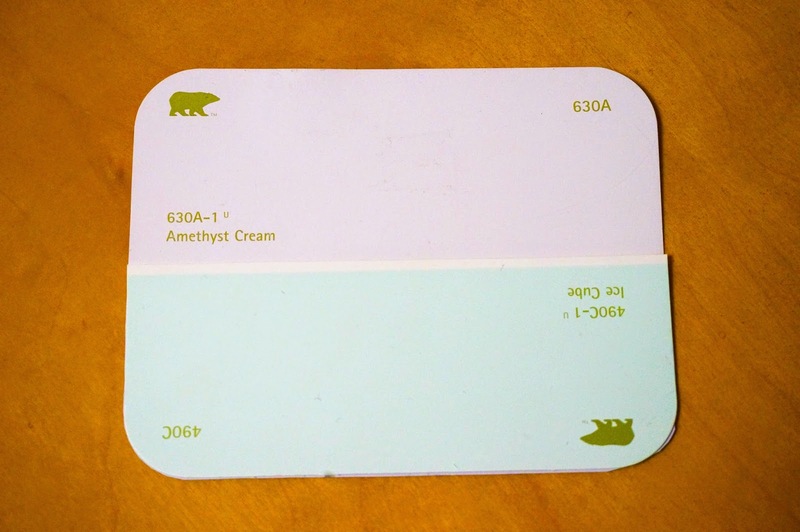 So I paid a trip to my local Home Depot and picked out a couple of pastel paint swatches from their huge selection of paint swatches! After many days of deliberation, I narrowed it down to two colors. I chose Behr's Amethyst Cream (a light lavender purple) and Ice Cube (a pale toned blue) as my final decision. Since the purple and blue came in a pale shade, I had to coverup the bright, seeping orange color underneath before I could paint on the delicate pastels. Thankfully, I had a can of white primer in my garage. With two coats of primer, I finally laid that hideous orange color to rest! Now I focused on the design of my walls. 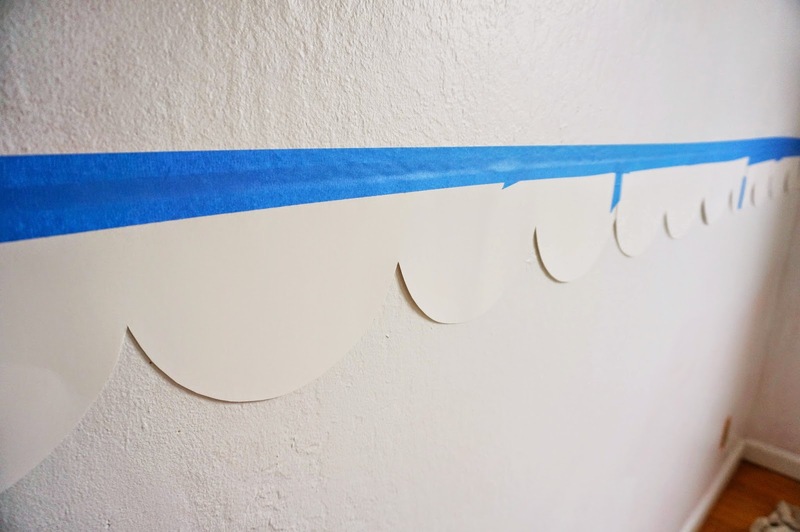 To make that delicate "scalloped edge" or "lace print" on my wall, I needed to buy the special precut painter's tape. However, I couldn't find it anywhere! This is what it looks like, but I couldn't find it. Instead of buying the tape I decided to DIY my own scalloped edge template. You have a crisp, pristine edge! I think I only paid a couple cents for the poster board. 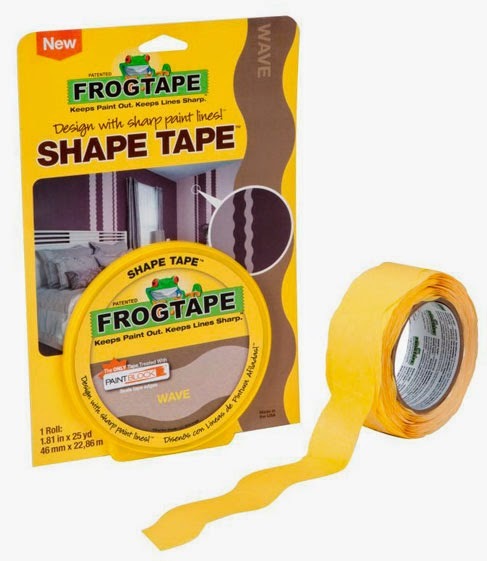 This sure beats spending money to buy the special tape! At first I was afraid it wouldn't hold up against the paint, but it did! 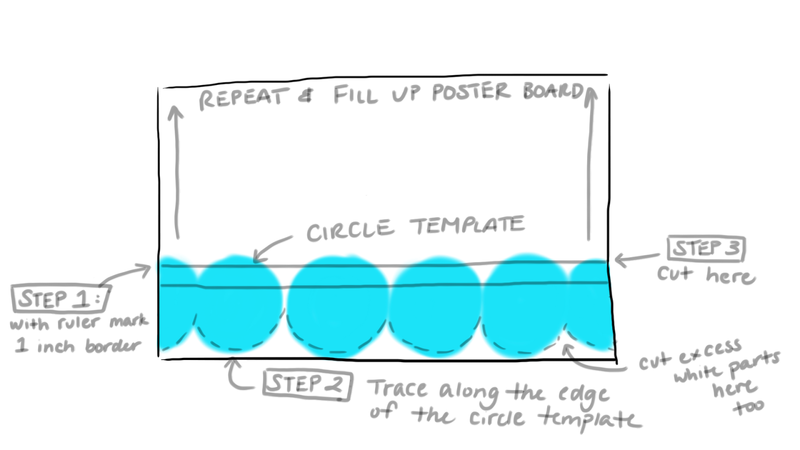 I think it's very important that you buy the heavy duty poster board! A bit of the orange was still peaking out of the white part, so I had to go over it an extra time with white primer to hide it. That took a bit of time, but it was totally worth the extra effort! After painting, I felt so accomplished that I managed to do everything by myself! I'm really happy with the design I did! Here are a couple of images of my new room color! I decided to move my bed to the opposite direction so I can get more sunshine in the morning! LOL! Also I finally got rid of the bed frame I was sleeping on for the past 20 years! Seriously though, that bed frame lasted me since I was in preschool. It definitely had to go! My dresser also had to make the move. Since I've rearranged the furniture in my room, everything feels a lot more spacious! I definitely admire the extra space. It feels less cluttered and dusty. 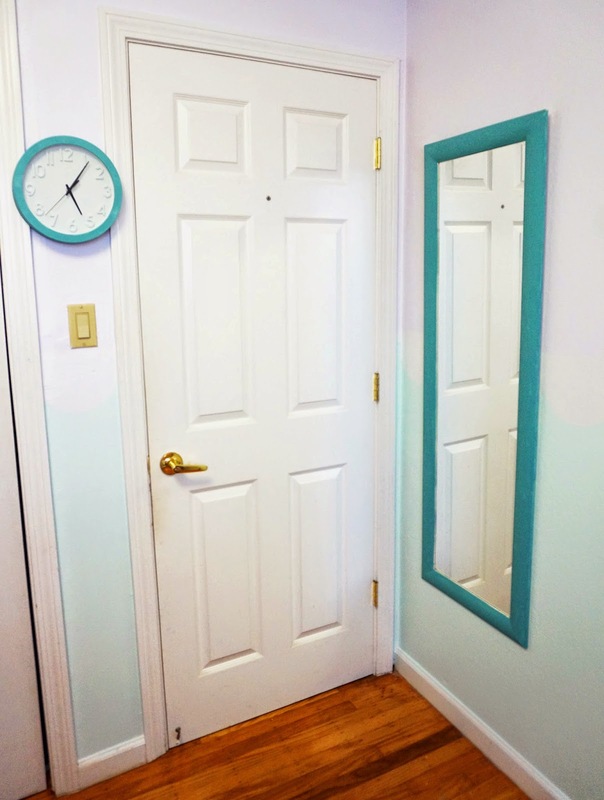 I repainted the clock and mirror to match the theme of the room! So that was my Spring Break! It was pretty productive. 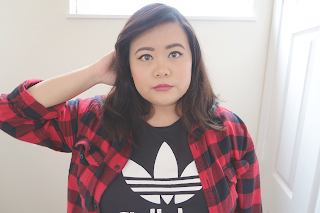 I got rid of the things that I didn't like in my room and now I am totally happy in my new creative space! I highly recommend everyone to fix up their room every once in a while. 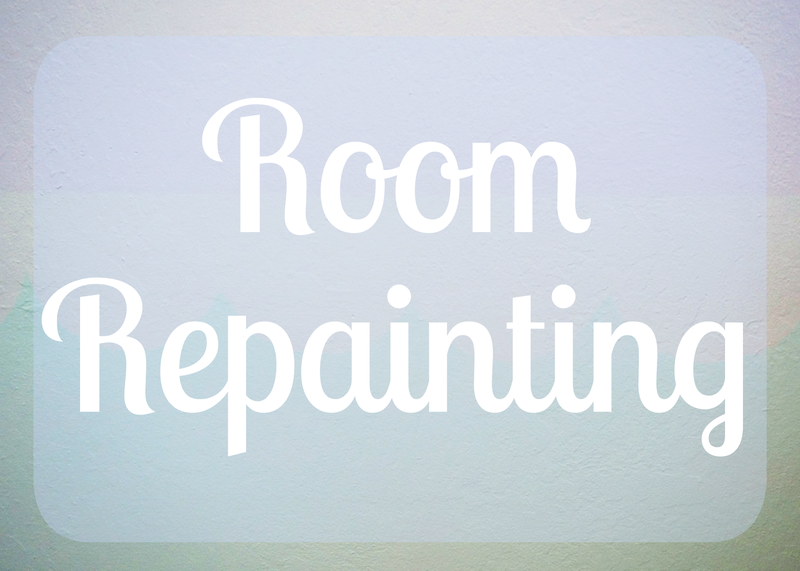 You don't have to repaint your walls, but try rearranging the furniture in your room! 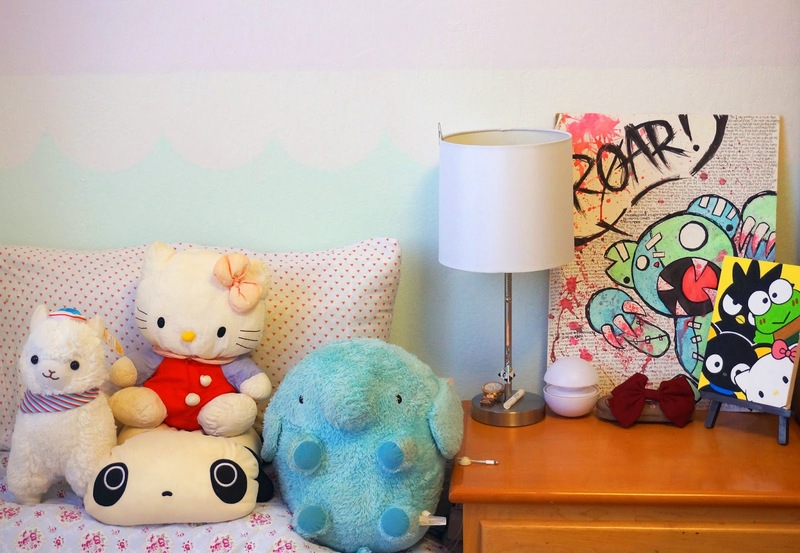 You'd be surprised what a little rearranging can do to your room. I guess relating to life, think of your room as yourself. Sometimes you need to do some mental rearranging. Change your attitude on the way you see things. It could make your life feel entirely different. So that it my little spiel of mental health wisdom, I hope everyone has a great day!